Whatever you need it for, if you’re looking for a strong, highly versatile shackle ideal for all weathers, you might want to consider our dee shackle with allen pin. Perfect for a wide range of uses, a dee shackle with allen pin essential for those who work in the marine or boating industries. Made from 315 grade stainless steel, they come with a flush fitting pin which can only be opened with the correct allen key. 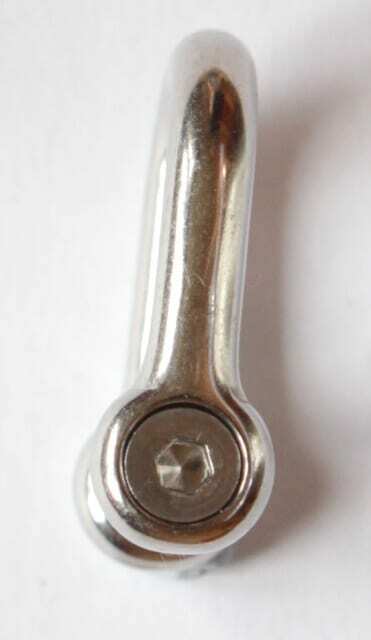 This offers better security than previous screw collar pin designs. Extremely popular amongst boating enthusiasts and in the marine industry, the high quality stainless steel means they are fantastically resistant to rusting, even when in contact with sea water. They’re perfect too for assisting in vehicle breakdowns when attached to a tow rope and are weather resistant for superb durability. Available in a broad range of sizes between 4mm and 19mm in diameter so you can find the one you really want. Based in the West Midlands, at Rope Services Direct we are pleased to offer a great range of dee shackle with allen pins for a variety of purposes. Whether you plan to attach it to a rope for crane work, or you plan to use as part of your lifting gear, our dee shackles can fulfil all of these requirements and plenty more besides. To order your dee shackle today, just fill out our speedy online form here. Want to speak to us about your project or need to ask a question? Get in touch with us on 01384 78004 so we can help. Stainless Steel Dee Shackle with Allen Pin Overall rating: 5 out of 5 based on 6 reviews.